Chop suey is a dish in American Chinese cuisine and other forms of overseas Chinese cuisine, consisting of meat (often chicken, fish, beef, prawns, or pork) and eggs, cooked quickly with vegetables such as bean sprouts, cabbage, and celery and bound in a starch-thickened sauce. It is typically served with rice but can become the Chinese-American form of chow mein with the addition of stir-fried noodles. Chop suey has become a prominent part of American Chinese cuisine, Filipino cuisine, Canadian Chinese cuisine, German Chinese cuisine, Indian Chinese cuisine, and Polynesian cuisine. In Indonesian Chinese cuisine it is known as cap cai, ("mixed vegetables") and mainly consists of vegetables. 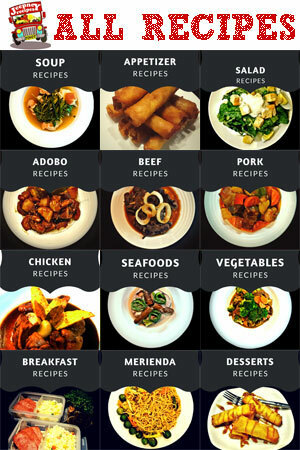 Chopsuey or Chop Suey is a popular dish in the Philippines. Almost all regions know this recipe. 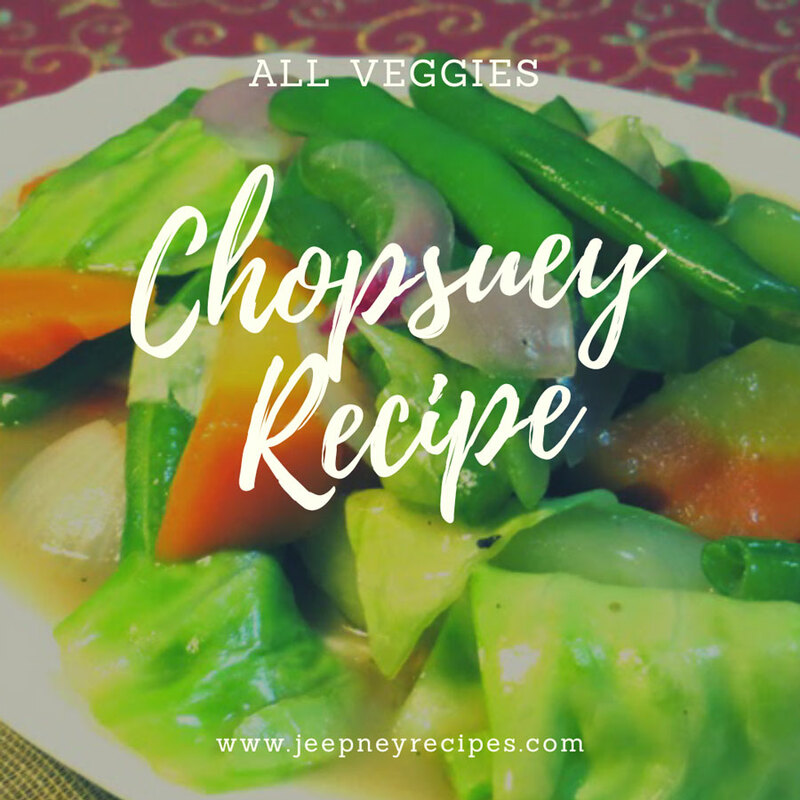 Philippines is very abundant with fruits and vegetables that is why aside from Pakbet or Pinakbet, Chopsuey is one of the favorite food of pinoys. Chopsuey is cooked best with meats like chicken, pork or shrimp. Meat brings out the flavor and complements well with the vegetables of chopsuey. Aside from meat, others prefer to add liver and quail eggs specially with special occasions such as fiesta or christmas season. But today, I'm going to teach you how to cook chopsuey all veggies recipe with no meat at all. Don't worry, the absence of the meat do not compromise the original taste of the dish. Your Chopsuey will taste better than what you are expecting. Just follow the steps properly. In a large pan, put 500 ml of water and boil. Boil the vegetables in this manner: carrots (5mins); followed by cauliflower, cabbage and baguio beans.wait for a 1 minute. Now add the red & green bell peppers and red & white onions. cook for 5 mins. Strain the vegetables and set aside. Keep the vegetable stock for the sauce. In the same pan, heat the 1 tbsp.regular oil and saute the garlic. After turning to light brown, pour the vegetables stock. Add 1 tbsp of oyster sauce. Season with salt and pepper. Cover and let it simmer. For the thickening agent, mix 2 tsp. cornstarch to about a half cup of water. Set the fire on low. Pour the thickening agent little by little to the vegetable stock while continuously stirring. If you reach your desired thickness of the sauce, add in all the boiled vegetables to the pan, sprinkle the powdered seasoning and mix well. Turn off the fire. While the chopsuey is still hot, add the sesame oil and stir a little. Transfer to a big plate and serve hot. You can also put some meats like pork and chicken. Also shrimp, liver and some quail eggs. Chopsuey left-over makes a good ingredients for Pancit Bihon Guisado.